This article provides an example of a micro business moving up to the SMB league with minimal investments in software and equipment. It uncovers how a small biz venture can implement a successful and cost-effective business model using Bitrix24 online services. a few couriers on bikes or vans (outsourced from a major courier company). Having gotten your loan approved, you move to a bigger shop with storage facilities, expand your staff from 4 to 12 persons, and hope to conquer the world (or at least the county). You expect the number of orders processed to be 5 times larger, and that will require thorough supervision. In order to operate as solid team, you'll have to deliver messages to other employees on regular basis. You also understand that it's time to delegating things to other people more actively. And don’t forget that you should always be always notified, and have access to crucial information 24/7. Expanding your regional footprint will require you to promote your services and acquire new clients. That means you'll have to somehow keep a full record of new and old contracts. It is also very likely that you'd hire a sales person, and use a CRM for processing orders. When finding new suppliers and incorporating a couple more freelance designers, you'll be building a network of service suppliers that you'll constantly need to communicate with. There's also a bunch of other things to consider when moving your company into the SMB league. But we got you covered. 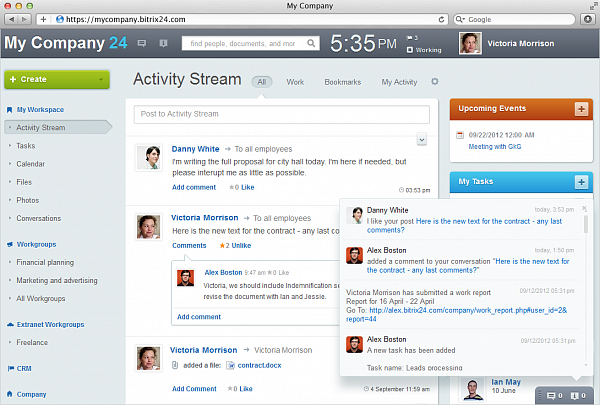 Bitrix24 is a social intranet. 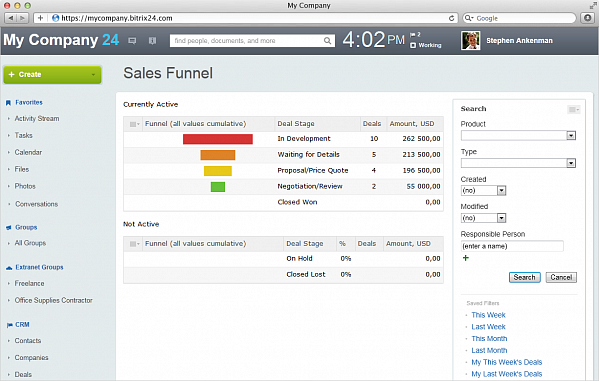 It creates transparency for your team by making the workflows visible at all levels. All work that takes place inside your social intranet gets instant distribution and feedback: messages, notifications, discussions, likes, etc. The Activity Stream can notify you about all changes happening in the company. Bitrix24 Mobile allows you to be informed 24/7. Using Bitrix24, you can store and organize your documents, create and manage an unlim ited number of projects, nest any number of subtasks, start discussions in the Activity Stream, and synch your Bitrix24 Calendars with your PC, Mac or iPhone. Bitrix24 allows you to create and manage roles for your staff. Not only can you use the visual company structure to organize departments, you can also set up different roles in the CRM which is built-in to your Bitrix24. For a small biz, it's usually enough to use the free edition of Bitrix24. However, for an additional monthly fee you can get outstanding tools for interacting and collaborating with your external contacts. Bitrix24 Standard ($99/month) and Bitrix24 Professional ($199/month) provide you with an extranet - a safe and convenient place for external interaction. 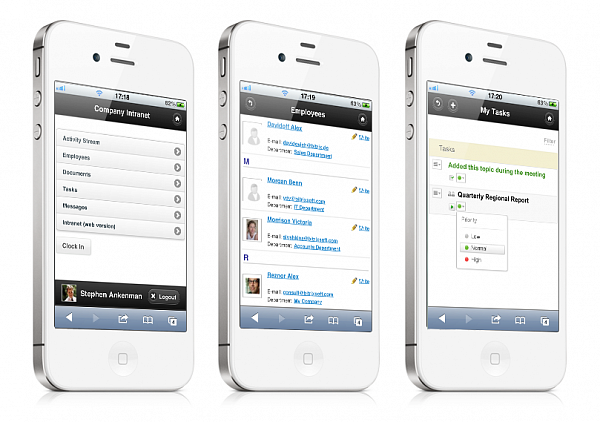 Using the extranet, you can invite people who are not part of your staff (freelancers, suppliers, media contacts, etc.) and collaborate on projects without compromising your internal workflow and data safety. So, you got your bank loan, hired new people, and streamlined all your business processes inside Bitrix24. We truly believe that Bitrix24 offers the ultimate set of tools for any small enterprise to operate smoothly. Jules Verne would have been mad to find out that this service allows you to run your company wh erever you are! Even twenty thousand leagues under the sea! So, grab this opportunity, and reserve your Bitrix24 name and create your very own social intranet. We'd love to see your Floral Corp blooming, and it'll be very flattering for us to know that some part of your success was assisted by the Bitrix24 team. Yes, you can integrate Bitrix24 with Active Directory. And this is HOW it should be done.